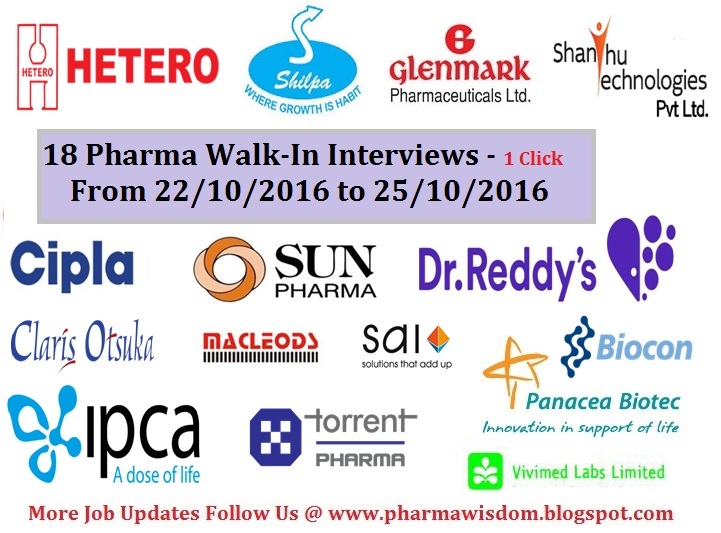 PHARMA WISDOM: 18 PHARMA Walk-In Interviews from 22/10/2016 to 25/10/2016 - ALL IN 1 CLICK..!!! 1. MEDREICH - Walk-In Interview for Freshers on 22/10/2016 @ Bangalore. 2. HETERO - Walk-In Interview for M.Sc Freshers on 22/10/2016 @ Hyderabad. 3. Panacea Biotec - Walk-In Interview on 22nd October, 2016 @ Delhi, Lucknow, Mumbai, Bangalore, Hyderabad, Chennai & Cochin. 4. Shilpa Medicare Limited - Walk-In for Chemistry Freshers as Production Chemist(80 Posts) on 22/10/2016 @ Hyderabad. 5. Shanthu Technologies Pvt. Ltd - Walk-In Interviews for Multiple Positions on 22/10/2016. 6. Glenmark Pharmaceuticals Ltd - Walk-In Interview on 22nd October, 2016 @ GOA. 7. Sai Life Sciences Limited - Walk-In Interview for Analytical R&D on 22nd October 2016 @ Hyderabad. 8.Claris Otsuka Pvt. Ltd - Walk-In Interview for Production & Packing Departments on 22nd October, 2016 @ Ahmedabad. 9. Ipca Laboratories - Walk-In Interview for Multiple Positions On 22nd & 23rd October, 2016 @ BADDI & CHANDIGARH. 10. Cipla Ltd - Walk-In for QC, QA and API ADL on 23rd October, 2016 @ Bangalore. 11. Biocon - Walk-In Interview on 23rd October, 2016 @ Aurangabad. 12. TORRENT PHARMA - Walk-In Interview on 23rd October, 2016 @ Alkapuri. 13. MACLEODS PHARMACEUTICALS LTD - Walk-In for Freshers & Experienced Candidates on 23rd October, 2016 @ Bangalore. 14. SUN PHARMA - Walk-In Interview on 23rd October, 2016 @ Chandigarh. 15. Panacea Biotec - Walk-In Interview on 22nd October, 2016 @ Bangalore. 16. Vivimed Labs Limited - Walk-In Interviews for API - R&D Department on 23rd October, 2016 @ Hyderabad. 17. Dr.Reddy's - Recruitment drive on 24th October 2016 @ Siddipet, Telangana. 18. Dr.Reddy's - Recruitment Drive on 25th October, 2016 @ Srikakulam, Andhra Pradesh. 19. Aizant Drug Research Solutions Pvt. Ltd - Walk-In Interview for Fresher & Experienced Candidates in Bioanalytical Department From 24th to 29th October, 2016 @ Hyderabad. Great Opportunity for my business Rotary Shaker Manufacturer in india & orbital shaker manufacturer in ahmedabad & incubator shaker manufacturer in ahmedabad & Laboratory fermenter manufacturer in ahmedabad & industrial fermenter manufacturer in ahmedabad & uma pharmatech machinery. I need support to approval the comment some people view our business. Great Opportunity for my business Rotary Shaker Manufacturer in india & orbital shaker manufacturer in delhi & incubator shaker manufacturer in ahmedabad & Laboratory fermenter manufacturer in delhi & industrial fermenter manufacturer in delhi & uma pharmatech machinery. I need support to approval the comment some people view our business.